See "How to order" in left Index for ordering information & our address. 24mm and 30mm wheels can be supplied for other axle diameters on request. 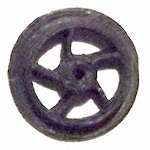 Packs of four, without axles – 2mm diameter required. Type usually used on skip wagons. 5 spokes, for quarry/mine wagons. 6 spokes, for quarry/mine wagons, or small coaches. 5 spokes, for quarry/mine wagons, or small coaches. Packs of four, without axles – 1/8" diameter required. Plain disc, for larger coaches. 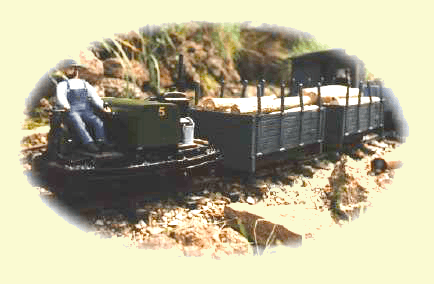 With six holes – W & L style, for larger wagons. Disc with four holes, for larger coaches. Disc with 5 holes, for larger coaches. 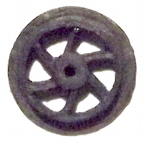 These are in packs of four, without axles – 1/8" diameter required. For Baguley "774" 20h.p. petrol locos. Includes jackshaft "wheel" & surround. For Baguley "677"10h.p. petrol locos. 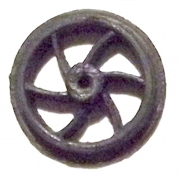 Spoked, with small balance weight. 5-hole disc with crankpin boss. WD18-WD21, and WD24 are based on wheels fitted to Bagnall and Kerr Stuart steam locomotives. Spoked with large balance weight and crankpin boss. Spoked with large balance weight with a central hole and crankpin boss. Pony truck wheels, supplied in pairs – 2 wheels. These wheels can be supplied in larger or smaller sizes. Approx. 4mm outside diameter. These will also fit our loco chassis kit. Approx. 4mm outside diameter; as supplied with CA5 Chassis. Plated steel, 75mm long, 2mm dia.